The city has now lost 33 officers in the line of duty, dating back to 1913. The grim events in San Diego’s Southcrest area Thursday night are all-too-fresh evidence of how risky police work can be. Jonathan De Guzman’s shooting death during a traffic stop was the department’s first on-duty fatality in nearly five years. Coming as it did in the wake of deadly police ambushes in Baton Rouge and Dallas, there's concern among those in uniform about a recent uptick in police casualties becoming "the new normal". “These things have to stop,” said retired SDPD Sgt. Bill Nemec, former president of the San Diego Police Officers Association. “These activists who are calling for the death of police officers -- we have to stop this kind of talk. This has gone beyond rhetoric." Nemec was on the force to see more than half of the city's officers who have been killed on duty buried. Between 1977 and 1985, ten officers died in the line of duty, ten by gunfire, prompting speculation that San Diego's finest maybe were too "laid-back". Before long, a series of fatal shootings on the part of officers raised concerns about an unspoken "no more Mister Nice Guy" approach in the ranks. Now, decades later, law enforcement has been coming in the crosshairs more frequently, with 34 peace officers nationwide shot to death so far this year -- versus 42 for all of 2015. 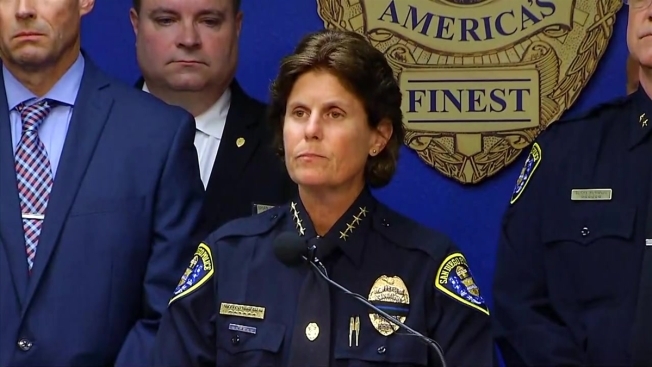 “The men and women get into law enforcement knowing the risks that they'll face, on a somewhat regular basis, unfortunately,” retired Chula Vista police captain Gary Wedge said. “But they never fully appreciate that 'it could happen to me',” Wedge added. “When something like this happens, it reminds us in law enforcement how vulnerable we are. But what I also think tends to get lost in that is the support the community gives." Law enforcement’s “top brass" fervently hope that people appreciate how quickly their badge-wearing protectors can become victims. “[De Guzman’s slaying] happened in just a matter of seconds,” Sheriff William Gore observed in an interview Friday. “And within a matter of seconds [the gunman] was able to shoot one officer in the throat and fatally wound another officer. And that happened in a split-second." One scary, trending theme sounded by officers who routinely work the streets is how much mental illness is “out there” these days and if society doesn't get a better handle on it, more of them -- as well as the average citizen -- will be in harm's way. "I don't think the officers nowadays have the support of the Justice Department,” Nemec told NBC 7. “And in some cases, local government has to step up. The officers are understaffed, they're overworked, and they're asked to do more and more."